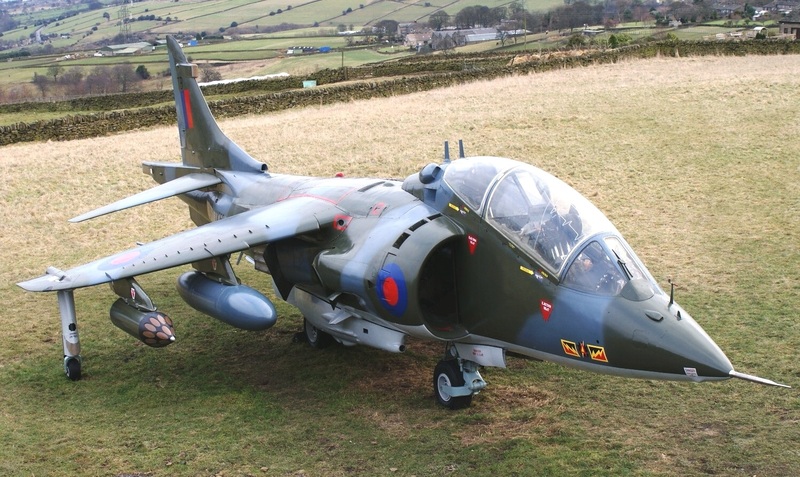 Harrier T2 XW269 – Restored! 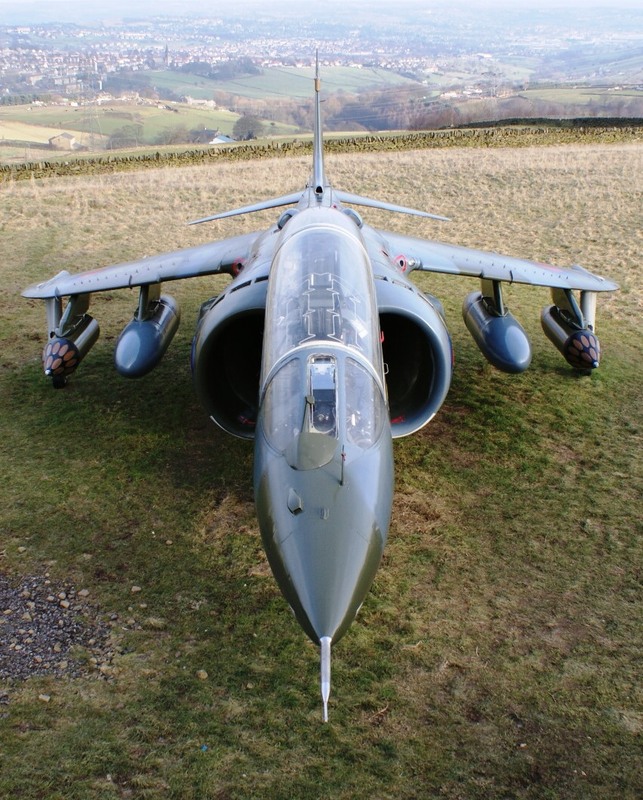 Yorkshire based Jet Art Aviation LTD have just completed a 12 month restoration of Hawker Siddeley ‘T-Bird’ Harrier XW269. This aircraft represents one of the rarer variants of this Classic British Aircraft, being one of only a handful of two seat examples. 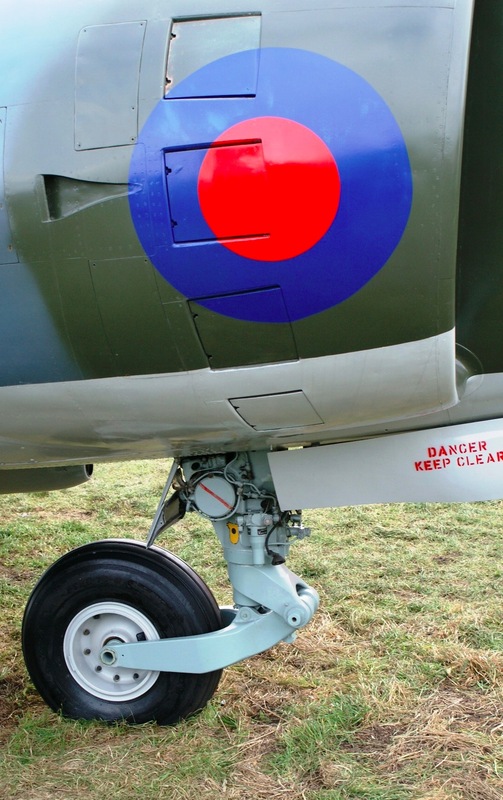 The aircraft has undergone a 12 month restoration to externally complete static display standard finished with an early T2 nose and repainted to early T2 specification with 3 tone camouflage paint finish. This is as the aircraft entered service with 4 Squadron RAF in 1971. A full set of external stores: 100 Gallon Drop tanks, SNEB rocket pods and Aden cannon gun pods fitted to the belly. XW269 served a long and interesting flying career having flown with: 4 Sqn, 1 Sqn, 3 Sqn, and the Strike Attack Operational Evaluation Unit (SAOEU) being used for weapons trials and testing under tactical conditions. The aircraft was finally used for â€˜Night Birdâ€™ AV8/GR5 Harrier trials with forward looking Infra Red being tried and tested on this very aircraft. This aircraft was last flown in 1997 after 26 years of service. The aircraft was acquired by Jet Art in November 2010. 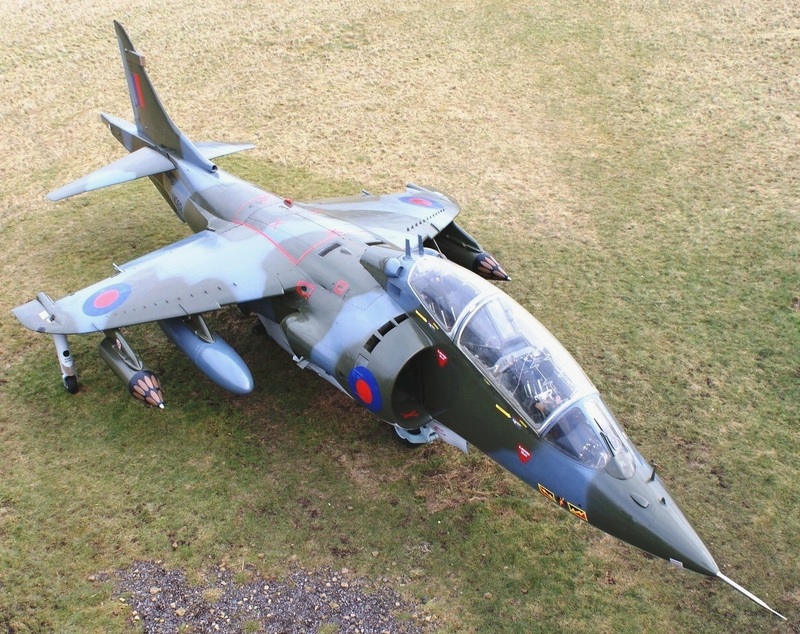 It is now the only first generation two seat RAF Harrier Aircraft finished to T2 specification any where in the world making this aircraft totally unique. With the early paint scheme and 4 Squadron markings Jet Art Feel this is a fitting tribute to the early days of the Royal Air Force Harrier force who operated from RAF Germany. The aircraft is now being offered for sale. 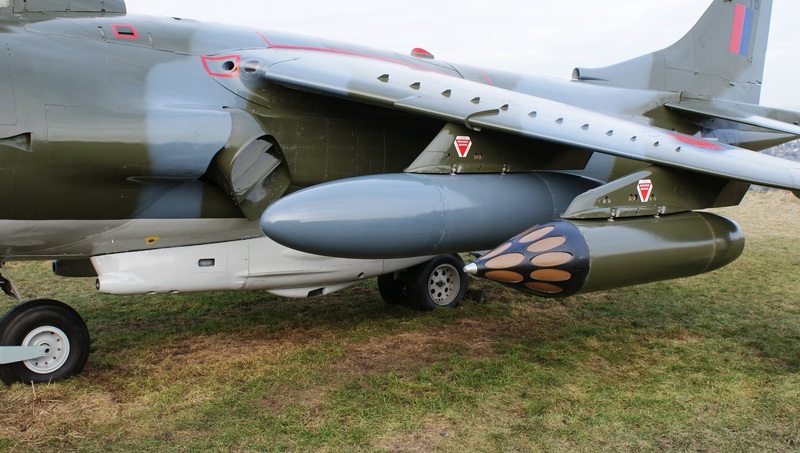 11 comments to Harrier T2 XW269 – Restored! I went to see the aircraft in all its glory yesterday. Chris has done a fantastic job restoring her. I flew in the rear seat just before I left 4 Squadron in 1975. Photo recce over the Rhine with Flt Lt John Thompson. Ended up not feeling too good ( one and only time I have ever been air sick!) I’m convinced the aerobatics were unnecessary! Fantastic trip down memory lane. It’s a shame we cannot get a syndicate going and purchase the aircraft ourselves. Chris thinks it will probably go overseas. Will try and upload a few old pics of my own, and will definately be at the next reunion. I see in my logbook that I flew the aircraft 18 times between 1986 and 1988. The last time was to Holbeach Range with Ritchie Profit (ex-3(F) Sqn Boss). What a brilliant effort with XW269. I too, flew in her in the summer of 1973 with John Roberts as pilot (later sadly killed in a mid-air collision). I remember the trip like it was yesterday – soon after take-off, flying under 4 Phantoms from Bruggen. On route to the Moselle ‘bouncing’ a Belgian AF Mirage and flying round the castle at Cochem, before departing up to the Gutersloh area and practising simulated attack profiles on some pongo vehicles, followed by aeros and the return to Wildenrath. I was disappointed that we couldn’t carry out a hover though, as the ambient temp was too hot – I guess the 101 engine just couldn’t hack it in those days; but at least I wasn’t sick! Back to the restoration, I see ‘269 is marked as TB (Tee-Bird). When it arrived on 4 in ’71, the first code was M (in red). This is seen in the photo I posted in the Gallery, with some of the Liney’s in front, in which, I think John Knight is 2nd from left front row. Well done to Jet Art Aviation and I too look forward to seeing John’s photos. Hi Pete, You are right, that’s me! On the Squadron photo we are standing next to each other. Have remembered quite a few names, I wonder what Priv Edgings, Eddie Torr and Paul Timms are doing now? Unbelievable to think most of us will be in our 60’s now! Strange thing is, I remember the Before Flight/ After Flight Inspection bits and pieces. Would have signed it off fit for flight yesterday apart from missing engine. Will look for my old photos, may need some help in uploading them. Jammy buggers. All I ever did was have a go at Ground Running it outside of the Hanger. The thing was you see; being Engines; I was too busy to fart about in the air and spent all my time working. Being a Super Sumpy has it’s penalties you know! Can anyone remember the poem I wrote that was called ‘Fournie’? Done in the same style as the song ‘Ernie’ by Benny Hill. Like Arthur, I too was to busy for joy ridding,lol, just keeping it flying. It’s a crying shame MOD can’t buy it and give back to FFFF. I will also help with any photo’s that need any restoring/repairing. roy.harrison@care4free.net. Cheers, See you at the next get together. Roy. I had been offered a flight before but was always too busy at Wildenrath. I was the Ground Radio Technician – Harrier Telebrief Systems on 4 Sub at Bad-Lippspringe I think it was. Sorry the year I cannot remember but it was in 74, 75 or 76 so only about 9 deployments. I asked the Ops. Officer to do a ground to air radio check as I had just repaired a radio for the site comms. I was faced with the Ops. Officer telling me to do it myself. Certainly a put up job as I knew nothing of this and was directed to the Safety Equipment Site and duly kitted up with all the appropriate equipment and duly placed in the rear seat of XW269. I was given a very intensive safety brief which was if I saw the pilots fists above the seat in front of me disappear he was on his way out and to follow him, quickly. The flight was fantastic, a short take off and a vertical landing. I lost count of the other Harriers that were missed and I commented about air misses and it was only counted if you could see the colour of the other pilots eyes. We upset a German farmer ploughing his field as according to the exercise map he was ploughing up a mine field! I was allowed hands on, should I have said that, for a while! What a flight something one will never ever forget. Is the pilot still around, can anyone remember this particular jaunt possibly set up by the Corporal in Safety Equipment who I knew quite well but whose name I forget. Thanks to all those involved. I was lucky enough to get two trips, both with Clive Loader in the front seat, in a T-Bird. First one was while on 1(F) in ’78 when we went out with a 1,000lb practice bomb and dropped it off the Isle of Man with a low level transit through Wales on the way home and a vertical landing. The second was while on IV (AC) in ’81, where we did a route that took in two of the dams that 617 damaged. Great memories! An update on XW269, She is now homed at the Caernarfon Airworld Aviation Museum . They have a Pegasus engine displayed alongside. Worth a nostalgic visit if in the area.